I received this Hamilton Beach Indoor Searing Grill for review at no charge and was not monetarily compensated for this review. All opinions, as always, are all my own. We love grilling out during the warmer months. Hubby mans the grill and I get to prop my feet up and relax. That doesn't happen too often for this moma I can tell you. During the spring the weather here in my neck of the woods can go up and down. One day it feels like summer, the next we are back into winter. It is just that good ol' Virginia weather. That makes it extremely hard to plan to get outside and use the grill as much as we like. And then there are weeks like this past week where we have days of nothing but rain, rain, and more rain!! I have tried many different grill pans, small indoor grills, and so forth and nothing fit just right. It is never fun when the smoke alarm goes off in your house because its too smoky. None curbed our craving for those foods we love on the outdoor grill so I assumed it was never going to be. So I was super happy when I was asked to try the Hamilton Beach Indoor Searing Grill to see if it was a good fit for our family. As a last ditch effort, I was hoping this was going to be THE one! The Hamilton Beach Indoor Searing Grill takes the guesswork out of grilling using a high searing temperature with an adjustable temperature control. A handy dandy light will even indicate when the grill reaches the desired temperature. Its easy to clean with a removable hood and drip tray. Both of which are dishwasher safe! We decided the first thing we would try on the indoor searing grill would be skewers. 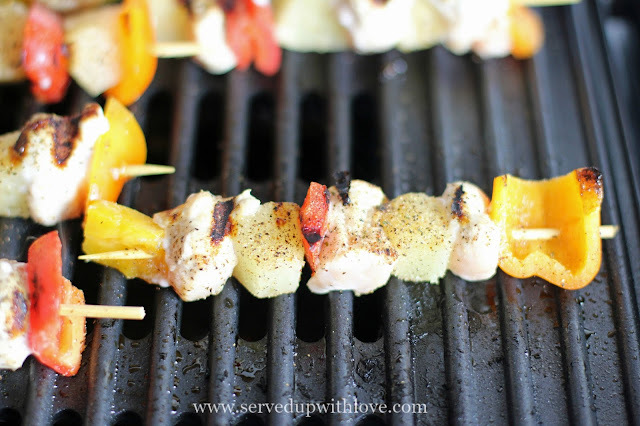 We love coming up with different skewer recipes for the grill so I knew that would be the perfect recipe to try first. Besides, what is more fun than eating something on a stick? So we pulled out all the ingredients, loaded up the skewers, and turned the grill on. All the while, it was pouring down rain outside. With not a worry of all the rain outside, we were grilling. Turns out, I had just been waiting for this grill to into our life because it is THE one! 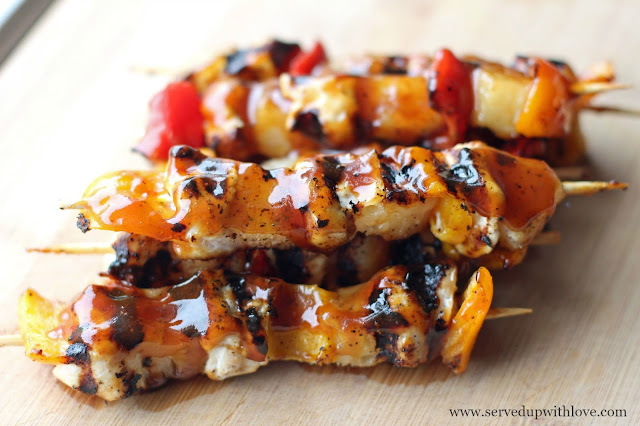 If using wooden skewers, soak in water prior to using so they do not burn. 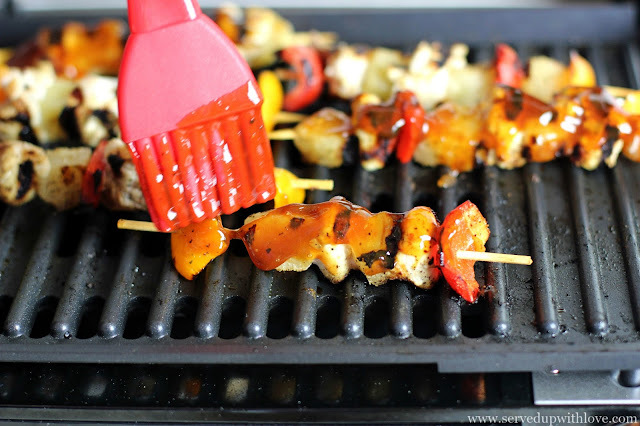 Load up the skewers alternating between the peppers, chicken, and pineapple. Add salt and pepper to taste. Sear on the grill for 15-20 minutes. Brush with BBQ sauce. Enjoy! AND GUESS WHAT?? 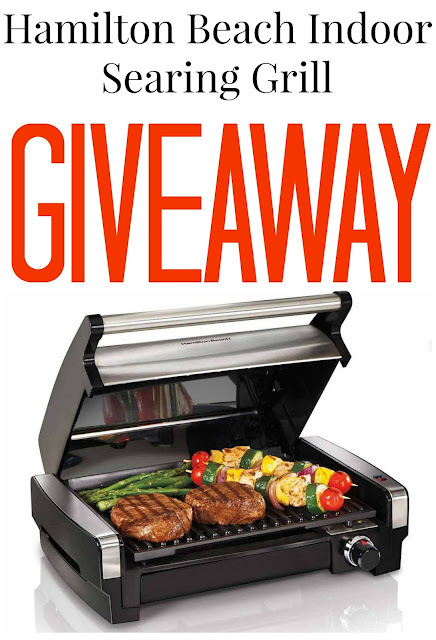 The great folks at Hamilton Beach are giving away one (1)Hamilton Beach Indoor Searing Grill to one (1) lucky winner. See official rules for details. Giveaway ends 5/21/2017. Giveaway is for a Hamilton Beach Indoor Searing Grill. Open to US residents 18+ only. One (1) winner will be chosen. Prize must be claimed within 48 hours of announcement or a new winner will be drawn. Prize delivered via US mail. 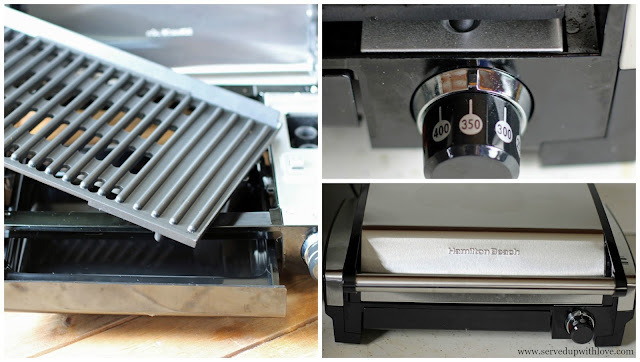 Hamilton Beach is not able to ship to PO Boxes. Served Up With Love/Melissa Haydon is not responsible for delivery of prize. All entries will be verified. This giveaway is in no way associated with Facebook, Pinterest, Twitter, Instagram, Amazon, Rafflecopter, or any other entity unless otherwise specified. My family enjoys anything thrown on the grill but I would say hamburgers take the top of the list. This little grill would be wonderful in our winters here in Ohio since sometimes it gets pretty cold and the snow adds up. We love burgers on the grill. This would be a great addition to your must have kitchen accessories. We have used it several times and love it. Kabobs would have to be my favorite - made with chicken or beef and lots of veggies. I love having burgers and hot dogs on the grill...hubby loves doing steaks. Love it all. My favorite food to put on the grill is chicken. It is such a versatile ingredient. I love making corn on the grill! Corn is perfect on the Indoor Searing Grill. Seafood is my favorite to grill. Especially lobster tails. I love to make shrimp skewers on the grill. I love to grill just about anything. My favorite is still a great steak. I like to grill a steak and burger. Nothing tastes better than a plain old grilled hamburger or blackened hot dog! My favorite food to throw on the grill is steak. Anything I can this time of year! Burgers, hot dogs, chicken! Seafood is my favorite food on the grill. My favorite would be shrimp! I love grilled burgers and veggies. I love burgers, steak, veggies.......you name it! We love the taste of BBQ food. Our old one rusted and we just never replaced it. Oh, we love your Creamsicle Fluff. Perfect. Marinated teriyaki chicken with some grilled pineapple. I love most any meat on the grill but my favorite vegetable is a whole onion! Swordfish is my favorite thing to throw on the grill. I love steaks on the grill.